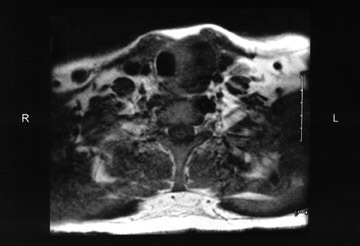 A 47-year-old man underwent ultrasonography of the thyroid for a neck mass. He had undergone right thyroidectomy and isthmusectomy 10 years earlier for a progressively enlarging thyroid gland. Multiple biopsies from this procedure were negative for malignancy. Preoperatively, thyroid antibodies were negative and, despite levothyroxine sodium therapy (Synthroid, Abbott Laboratories, Abbott Park, IL), thyromegaly progressed. The patient reported difficulty swallowing solid foods but no other compressive symptoms. Pathologic findings were consistent with Riedel's struma, displaying inflammatory fibrosclerosis with hyaline bands of coarse fibrosis. The left thyroid lobe was not explored. Following surgery, the patient noted an improvement in swallowing. 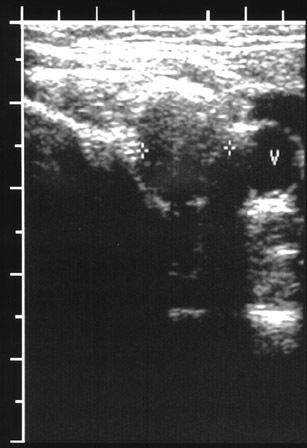 The patient underwent ultrasonography of the neck, which showed a 3-cm hypoechoic mass with posterior shadowing within the lateral aspect of the remaining left thyroid lobe (Figure 1). There was minimal normal thyroid tissue medially. One month later, an I 123 thyroid scan was performed at an outside institution that revealed absent uptake on delayed images (not shown). 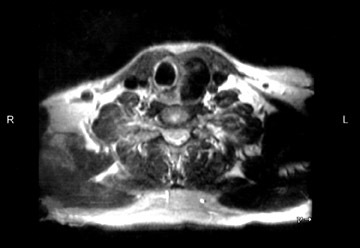 Three months later, magnetic resonance (MR) imaging of the neck was performed (Figure 2). Low signal intensity was present throughout the left lobe on T1-weighted images, with further decreased signal intensity on T2-weighted images. 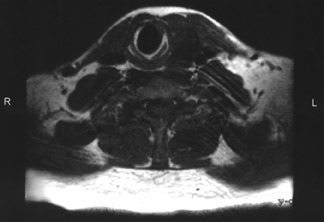 Mild extrinsic impression on the esophagus and tracheal deviation to the right was also found. Riedel's thyroiditis is a rare entity in which fibrous tissue replaces the thyroid gland and tends to extend into the surrounding tissues. 1 It was first described in 1883 by Bernard Riedel. 2 In 1957, a study by Beahrs et al 3 found Riedel's thyroiditis in 20 of 40,000 thyroidectomies over a period of 36 years, attesting to the rarity of the disease. Hay et al 4 found that the overall incidence in the ambulatory setting is 1.06 in 100,000 individuals. The exact etiology is still unknown. 1 Although it was previously thought to represent the later stages of Hashimoto's thyroiditis, Riedel's thyroiditis is now recognized as a unique disease process. 5 Early lesions show inflammatory cell infiltration with destruction of normal thyroid architecture. Ensuing fibrosis replaces normal thyroid tissue and is not confined to the thyroid gland. 1,8 Thyroid function is typically preserved until later stages when patients exhibit hypothyroidism, which can also occur from fibrotic infiltration of the parathyroid glands. Riedel's thyroiditis is a rare fibrotic process involving the thyroid gland and surrounding soft tissues. 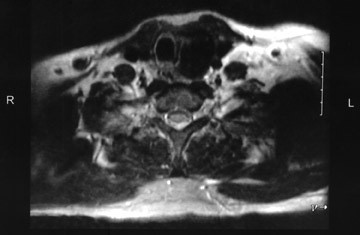 The imaging appearance, as typified by this case, reflects the fibrosis. 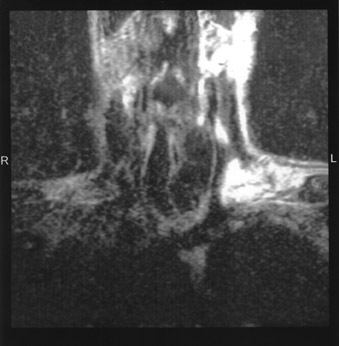 The lesion can be expected to be hypoechoic, with poor through transmission, on ultrasonography and to have low uptake on scintigraphy and low signal on T1- and T2-weighted MR sequences.